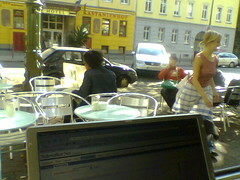 There’s no better work situation than sitting in the sun in a café with internet access..
Tuesday, 11 o´clock, Café Napoljonska, Kastanienallee, Berlin. They have the best cakes, cookies and ice cream. I like to sit there and work and watch the people pass by and drink coffee and read the newspapers. Sounds like leisure but actually I had some of my most productive hours there..